This short but well rounded article is a great read for everyone, whether you are new or have been exposed to Buddhism for a long time. It sums up the core concepts of Tibetan Buddhism succinctly enough for the beginner Buddhist to grasp, yet is deep enough to hint at the wisdom required to fully understand the true meaning of non-duality. While the article primarily refers to a western audience, it is excellent reading for people who come from environments where Dharma is scarce or weak. From my years of teaching, I have found that it is highly possible for communities to label themselves Buddhist and yet have little to no knowledge of the Buddhadharma. This leads to superficial practices amounting to mechanical offerings of incense, water, tea or candles. This is very unfortunate as such practitioners have sufficient faith and trust to make the effort to “practice” but lack the knowledge and guidance to take it to the next level in order to reap the full benefits of true spiritual practice. The author has carefully highlighted various aspects of Tibetan Buddhism, from philosophical to spiritual and ritual. I encourage everyone to read this article a few times and understand it well. By understanding the value of Buddha’s teachings, you will find the inspiration to revisit topics such as Karma, the Twelve Links of Dependent Origination, the Power of Prayer and Ritual, etc. with much vigor and enthusiasm. I would like to thank Professor Reginald Ray for writing such a powerful article and I wish everyone great success in your spiritual endeavors. While Westerners have tended to view unseen beings as superstition or mere symbolism, Reginald Ray argues that communication with unseen beings through ritual is at the very heart of tantric Buddhist practice. Truth makes little sense and has no real impact if it is merely a collection of abstract ideas. Truth that is living experience, on the other hand, is challenging, threatening, and transforming. Tibetan Buddhism is a way of experiencing the world. In many ways, it is quite different from the dominant trends not only in the West, but in the “modern, technological culture” that is now rapidly encircling the globe. There are many parts of the traditional, conservative, medieval culture of Tibet that we will never be able to appreciate or understand. But there are other parts, particularly its Buddhist heritage, that can help us see with new eyes the limitations and possibilities of our own contemporary situation. Buddhism is a particularly interesting tradition because it has one foot in the past and one in the present. On the one hand, it arose at a time when India was undergoing transformation from a more primitive to a “high” civilization. Buddhism has the same literacy, scholasticism, professional elites, institutionalization, hierarchies, political involvements, and monetary concerns as do the other “high religions” that evolved after the invention of agriculture and that we now largely identify as our own ways of being religious. At the same time, the Buddha claimed, “I follow the ancient path,” and by this he meant to show a “way back” to a more fundamental experience of human life than the one evolving in his day. Tibetan Buddhism, perhaps more than any other form of Buddhism, has retained the raw and rugged experience of this “primordiality” as the basis of its spirituality. In this sense, it is concerned not with truth that is fixed and dead, but with truth that is alive and constantly emerging. Traditional Tibetans lived in a world that is, in many respects, quite different from the one assumed in modern Western culture. It is not so much that the classical Tibetan worldview contradicts the findings of modern science, but rather that it emphasizes different things and has a different overall shape and configuration. Most importantly, in the classical Buddhist view, the world is defined not only by what we can perceive with our physical senses and think about rationally. It is equally made up of what cannot be seen, but is available through intuition, dreams, visions, divination, and the like. The senses and rational mind provide access to the immediate physical world, but it is only through the other ways of knowing that can one gain access to the much larger context in which this physical realm is set. Can modern people have experience of this traditional Tibetan cosmology? Tibetans will tell you that their experience of the universe is accessible to anyone who cares to know it. If you know where to look and how to look, they say, you will see for yourself what we are talking about. The Tibetan cosmos is a vast one, beginningless and endless in terms of time, and limitless in extent. Worlds, each inhabited by sentient beings, extend on and on throughout space, with no end. This context of infinite space and time, with innumerable worlds, provides the arena for samsara, cyclic existence. Samsara refers to the condition of beings who have not yet attained liberation, whose existence is still governed by belief in a “self” or “ego.” Those still within samsara are thus blindly driven, through the root defilements of passion, aggression, and delusion, to defend and aggrandize the “selves” that they think they possess. This action produces results or karma, that become part of who they are. When samsaric beings die, they are subsequently reborn in the same or another realm, in accordance with their karma. Normally this process, and the cycles of pain and pleasure that it entails, goes on without end. The various samsaric worlds are known as “impure realms,” that is, places where the condition of samsara prevails among the inhabitants. The situation is not hopeless, however, for there are other realms of being that stand outside of samsara. These are the “pure realms,” characterized by enlightenment, the abode of the “realized ones,” those who have attained liberation from samsara and who dwell in various pure lands. These beings are: the celestial buddhas with their various manifestations; the yidams (personal deities), male and female, also called wisdom dakinis and herukas; the great bodhisattvas such as Avalokiteshvara and Tara, who will come to the aid of beings; the dharmapalas (dharma protectors), who watch over and guard the dharma itself and those on the path; the enlightened men and women who have passed beyond this world, and others. These various enlightened ones represent a state of realization that is available to suffering sentient beings. In fact, according to the type of Buddhism followed in Tibet—Mahayana Buddhism—the state that they embody is the ultimate and final destiny of all humans and other sentient beings. All sentient beings are on the path that will one day lead to the attainment of the complete and perfect enlightenment of a fully realized buddha. Although the “home” of the buddhas and high-level bodhisattvas is outside of samsara, they appear in our world to help us enter the path of liberation and follow it to its conclusion. The human Buddha Shakyamuni thus appeared twenty-five hundred years ago, bringing the dharma to this world for the first time and founding a lineage of the study and practice of the teachings. Likewise, the celestial buddhas, bodhisattvas, protectors, dakinis and departed teachers appear in our world in various ways, bringing blessings, protection, and guidance on the path. Moreover, even this realm has more dimensions and subtleties than modern people usually ascribe to their world. In the traditional Tibetan view, the animate and inanimate phenomena of this world are charged with being, life and spiritual vitality. These are conceived in terms of various spirits, ancestors, demigods, demons, and so on. Every river and mountain has its spirit embodiment or inhabitants. Each human habitation has a spiritual presence as part of its own being. As this variety suggests, spirits appear with various levels of development and motivation. Some are malevolent; some are neutral, and others are generally beneficent. These traditional cosmological perspectives create a uniquely powerful environment for the practice of Tibetan Buddhism. The boundless temporal and spatial vistas reveal the fragility, brevity and ultimate futility of human life, taken on its own terms. The view of the phenomena of this world as spiritually charged allows intimacy, relationship and mutuality with the relative world. The understanding of samsara as the endless repetition of life followed by death followed by life, all governed by karma, suggests that lasting happiness in the ordinary sense is not attainable. The introduction of buddhahood as standing outside of samsara provides an alternative to this daunting and frightening prospect. The fact that buddhahood is not only available but is the ultimate and final destiny of all instills fundamental optimism and a sense of the value of life. And the limitless time frame in which this can be achieved enables people to relax and to take their spiritual journey at its own pace. In this way, Tibetan Buddhism has achieved the seemingly contradictory goals of revealing the radical inadequacy of samsara, leaving its adherents little option but to look to a spiritual path, while at the same time rousing them to a sense of confidence, joy and well-being at their human condition and its literally infinite possibilities. To what extent can the contemporary Western Tibetan Buddhist practitioner dispense with some or all of these unseen, nonhuman beings? From the Tibetan point of view, relationships with the unseen world are essential to a full and successful human life. Ignoring one’s relationships with the whole world of unseen spirits and spiritual beings is, in fact, as senseless and counterproductive as ignoring the people and conventions of one’s own immediate human society. It is simply not possible to live in such a way. Buddhism is normally thought of as a nontheistic tradition, and this raises the question of how such spirits, gods, and deities are to be understood within the Tibetan Buddhist framework. Certainly in Tibetan life, whether it is a question of the malevolent mamos, the potentially beneficent hearth god, the deities of the god realms, or the dharma protectors or tantric yidams, the nonhuman beings are understood at least on one level as more or less independent, objective entities. They are beings with whom one must be in constant relation, even though they are nonhuman and usually not visible. At the same time, however, from the point of view of the philosophical and meditative tradition, all such nonhuman beings are ultimately seen as aspects of one’s own mind and not separate from it. But what does this actually mean? Frequently, particularly in the West, this standard Buddhist assertion is taken to indicate that such spirits and deities, taken as external beings by ordinary Tibetans, are not really external at all; that in fact they are mistaken projections of psychological states. This, then, becomes a justification for treating them as nonexistent and provides a rationale for jettisoning them from Western adaptations of the tradition. The problem with this approach is that it reflects a misunderstanding of what is meant by the statement that such entities are aspects of mind and inseparable from mind. The deities are more properly said to be aspects of one’s own innate mind, or reflexes of one’s awareness. For example, the buddhas, although apparently objectively existing beings, are fundamentally nothing other than our own enlightened nature. The protectors are representations of the wrathful and uncompromising energy of our own awareness. And the gurus are objectifications of the teaching and guiding principle as it exists within each of us. In a similar manner, the various samsaric spirits and demons may be seen as embodiments of peripheral states of one’s own mind. These apparently externally existent beings, then, are false bifurcations of the primordial nondual awareness that lies at the basis of all experience. So far, so good; but here is the really critical point: it is not only the beings of the unseen world that have this status, but all of the phenomena of duality. In the Tibetan view, ourselves, other people, trees, mountains and clouds—indeed all of the phenomena of the entire so-called internal and external universe—are nothing other than false objectifications and solidifications of nondual awareness. To say this is not, however, to discount their external and “objective” existence within the relative world of apparent duality. The samsaric beings of the six realms, as well as the Buddhist deities existing in the state of nirvana, initially make themselves known to us ordinary, unenlightened people as external, objectively existing beings. In fact, on this level, they can appear as significantly more real, vivid and powerful than the ordinary physical universe that surrounds us. On one level, then, such beings certainly do exist and are important co-inhabitants of our cosmos. Thus to say that they are aspects of mind is not to deny their existence on the relative level. Nor does it obviate our responsibility to deal with them and relate to them on their own level and as they present themselves to us. What, then, does it mean to say that these unseen beings are all aspects of mind? It means simply that the way we experience and conceive of them has to do with our own psychology and level of awareness. Ultimately, the apparent duality of subject and object is not given in reality. It is a structure that we, out of fear and ignorance, impose on the world. When we see the phenomenal world truly as it is, we realize a level of being that precedes the subject-object split. This is the true nature of “experience,” “awareness,” or “nondual mind,” understood at this point as interchangeable categories. When Tibetans say that the spirits, gods and deities are aspects of mind and nothing other than mind, they mean it in this sense, that their fundamental nature—as indeed the nature of all phenomena—is nondual awareness. We humans, then, are just one part of a vast, interconnected web of relationships with all other inhabitants of the cosmos, both those still living within delusion and those who are awakened. An awareness of these relationships is critical because, to a very large extent, who we are as humans is defined by this network of relations. From the Tibetan perspective, to live a genuinely human and fruitful life, we need to discover our relation with all these various beings of samsara and beyond, and to act in ways appropriate to our connection. The way we do this is through ritual. Ritual is action that expresses a relationship. It is the vehicle of communication with another and is itself that communication. In Tibetan Buddhism, ritual is used in relation both to the seen and the unseen worlds, and the essence of Tibetan Buddhism is communication with the awakened ones—departed masters, bodhisattvas, buddhas, and so on. We call them to mind, open our hearts to them, and receive their blessings. In revered teachers, a state of realization is embodied in human form. In the celestial buddhas and high-level bodhisattvas, however, the embodiment is more ethereal and not within the human realm. Nevertheless it is not only possible but essential that, as we go along the path, we also discover and deepen our sense of communication with these nonmaterial, awakened ones. According to Tibetan tradition, in fact, as we mature, the “sky draws closer to the earth,” so to speak, and the celestial buddhas and bodhisattvas seem more and more our ever-present protectors, mentors, and guides. One of the most common ritual means for communicating with the realized ones is the sevenfold offering of mahayana Buddhism: one visualizes the being or beings in question, then  offers salutation,  makes real and imagined good offerings,  confesses one’s shortcomings and harm of others,  rejoices at the existence of the awakened being or beings who are the beloved object(s) of devotion,  requests them to teach, thus expressing one’s openness and longing for instruction,  asks them to remain in connection with suffering samsaric beings and not disappear into nirvana, and  dedicates whatever merit or goodness one has accumulated to the welfare of all beings. In this simple, brief rite, one makes a link with the transcendent ones, affirming and actualizing a specific kind of relationship with them. The reason that we can do this in the first place is that the buddhas, bodhisattvas, and departed masters already represent who we most essentially are and must in fact become. This is why, in Tibetan Buddhism, even the most devotional supplication to the most seemingly external being is not finally theistic. For, in truth, we are longing to meet our deepest selves face-to-face, and we are supplicating our own hidden being. The path to this goal is first, to discover our innermost being in the other, the awakened one, and then, through relationship with him or her, gradually to come to awareness of that transcendent nature within ourselves. In Tibetan Buddhism, there are many ritual stages along this path to awakening. What they share is visualization. We create a mental picture of a departed teacher, a high-level bodhisattva, or a buddha. Then we carry out a ritual in which we open ourselves and communicate with this being in various ways, ritually participating in his or her awakening. In this way, we cultivate our own awakened state. This process of visualization is a powerful one. For example, in our ordinary life, what we do not visualize as existing does not exist for us. If we do not see another person as human, then for us their humanity does not exist. The same is that much more true for beings who live in nonmaterial forms outside of samsara. We may be surrounded by buddhas and bodhisattvas all the time, but until they have a shape and a name, we do not see them or have access to a relationship with them. For us they might as well not exist. But the moment we give them a form in our mind and begin to communicate with them, they exist, and their wisdom, compassion, and power can enter into our own systems. It is the many ritual forms of Tibetan Buddhism that enable us to do this, and within traditional Tibet, the reality of ritual is simply accepted as a matter of course. It is assumed that just as there are forms by which to relate to other human beings, so there are other forms that are used to communicate with the nonhuman and nonmaterial realms. The status of ritual among Western followers of Tibetan Buddhism is, however, more in question. Many have felt unable to entertain the ideas of reincarnation or of the six realms. 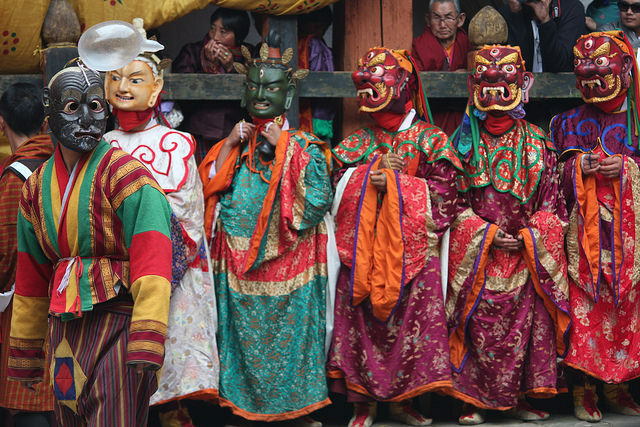 For them, many of the traditional Tibetan rituals dealing with other beings and other realms do not make sense. Sometimes this extends to thinking that even talk of nonmaterial buddhas, bodhisattvas and protectors is “symbolic,” and that there is nothing that really corresponds to these designations. In that case, many of the Tibetan liturgies are seen as directed to no real object, but are rather understood as psychological ploys to bring about certain effects. Even if we Westerners do pay lip service to the traditional Tibetan cosmological ideas, often, as Jeremy Hayward has argued, we remain at heart what he calls “scientific materialists.” In other words, while we may accept the idea of other realms and other beings within and outside of samsara, we do not actually believe in them. Instead, we live as if the world were dead and this reality the only one that exists. This attitude is reflected in many Westerners’ difficulties with Tibetan ritual. Among Western practitioners, there is frequently a kind of dead feeling in ritual, and many of us fall back on the idea that rote repetition, without any particular engagement or feeling, is sufficient. We fall back, in other words, on attitudes to ritual learned in our upbringing, where simply to be physically present was all that was required. In order to survive the many meaningless rituals we may have been subjected to, we also learned to disengage ourselves psychologically and to occupy our time with thinking about other things. What is missing here is the understanding that ritual is a way of communicating with beings who, on the relative plane, really are there and really are important to us. This lively and compelling sense of ritual is, at present, sometimes hard to come by in Western adaptations of Tibetan Buddhism. Through ritual, genuinely undertaken, one is led to take a larger view of one’s life and one’s world; one experiences a shift in perspective—sometimes subtle, sometimes dramatic. This shift feels like a diminishing of one’s sense of isolated individuality and an increase in one’s sense of connectedness with other people, with the nonhuman presences of our realm, and with purposes that transcend one’s usual self-serving motivations. Ritual is a way of reconnecting with the larger and deeper purposes of life, ones that are oriented toward the general good conceived in the largest sense. Ironically, through coming to such a larger and more inclusive sense of connection and purpose, through rediscovering oneself as a member of a much bigger and more inclusive enterprise, one feels that much more oneself and grounded in one’s own personhood. Through ritual, one’s energy and motivation are roused and mobilized so that one can better fulfill the responsibilities, challenges and demands that life presents.